I just have to share my utter elation at this moment. And, while certainly saving related - this may not be the saving you would expect! Over the weekend I spent my days in meetings about expanding SavvyShopperDeals.com to the entire state of Utah. My colleagues and I also had the opportunity to get to know each other a little better. In the process we laughed about my savvy farm life: the cows running through the garden, the horses breaking trees in the orchard and roosters chasing the kids around. I also mentioned our cats, which I HAVE to get fixed as they keep having babies. So appropriately, we came home Saturday and on Sunday morning, in addition to finding Easter Eggs, we found 4 newly born kittens as well. The kittens are absolutely darling (anyone need a kitten?) and lovable. Macgyver, the kids and I moved the momma and her babies to a safer location than the previous haystack birthing center and thought all was well. We put them all in a kennel overnight to make sure mom and babies would be safe. But this morning, as I was working on round one of Utah Grocery Deal Emails, I saw the mother cat heading back to the haystack. I went down to the garage to see if she was planning on moving her little brood back to the stack, to potentially be crushed, and to my surprise found a fifth kitten, cold and lifeless, had recently been placed in the kennel. We had left a kitten behind in the move! I swear I searched that haystack to make sure all the kittens had been found, but alas, one tiny orange snuggly ball of fluff was left behind to brave the cold night alone. The kitten was silent and fairly rigid. Thinking it had surely passed, I gently laid it down quietly pondering what I should do with it. 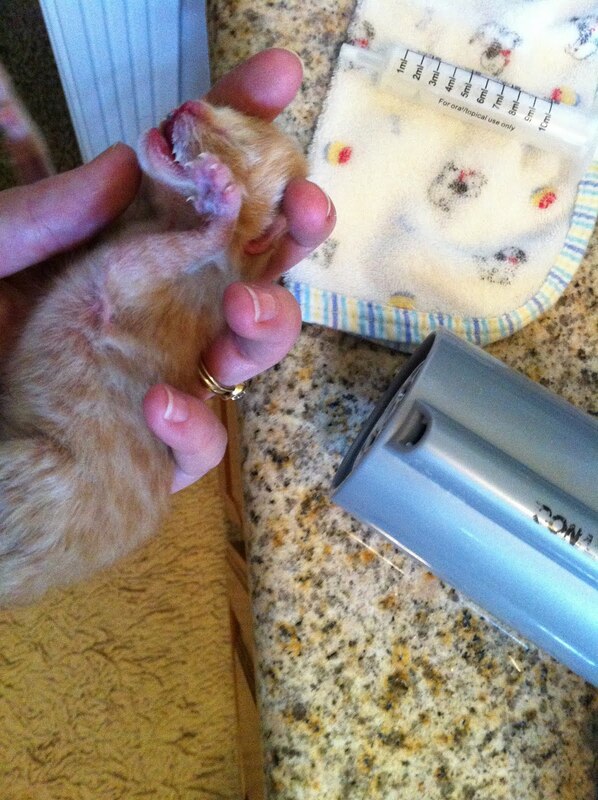 It was then I felt impressed to try my own version of kitten CPR and make sure there was no chance for life. I pushed gently and rhythmically up and down on the cat's fragile chest. Nothing. I laid the kitten down again and was about to scour the haystack once more when I felt impressed to pick up the baby and try again. I rubbed and rubbed its' slender torso. I even blew a little in the baby's mouth (a sight to see I'm sure!). And then to my surprise it moved slightly. Was there a chance it could still be alive or had it passed so recently that I was merely witnessing a muscular contraction? I ran in the house, turned on the blow dryer and grabbed a syringe filled with warm milk. It seems like this month I've been blogging about ethical couponing non-stop! Why is that? Well, with the upsurge in shoppers watching the new Extreme Couponing series on television there has been an equally appalling upsurge in the promotion of unethical coupon practices. Lately I feel like I'm fighting to keep couponing as I know it alive by trying to debunk these erroneous tactics. With every passing episode I wonder what the impact of these fraudulent savings tactics will have on me, my family and all of you, my friends? I believe whole heartedly that there WILL be changes to the way we coupon coming down the line very soon and they won't be good! It's frustrating to see couponers and people preying on couponers trying to make a buck off unethical coupon practices so I've decided to speak out against these dishonest savings methods. It's not my intent to stand up on a soap box and preach to anyone, I just want to make the truth available for those deal seekers who want to save well, but save right! And, hopefully all of you can spread the truth to all the newbie couponers and all the oldie, but goodie, couponers as well. 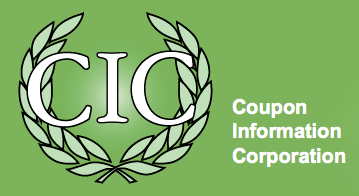 "For more information on this, I suggest you reach out to the CIC (Coupon Information Corporation)." Never paying money for coupons. This includes buying coupons from companies/individual who “sell the service of clipping coupons” instead of the coupons themselves. (Think about it, you really ARE BUYING the coupons, yet the business will insist you’re not. Does that make any sense? Does it inspire your trust? Do you really want to provide them with your financial information?)" And as for these coupon clipping companies who claim they are not really selling coupons, but rather you are paying for their time to cut them out, I would ask, "Why does it take more time, and thus cost more money, to cut out higher value coupons?" Do the higher valued coupons require specially made scissors or is there some other costly equipment to maintain to justify their higher price? Umm... no! Of course they're selling coupons! "There’s only one legitimate way to use a coupon: Cut it out of the newspaper or other source and use it toward the purchase of the designated product. A coupon is meant to be used only by the consumer who buys the product for which the coupon is printed. Selling or transferring coupons to a third party violates most manufacturers’ coupon redemption policies—and usually voids the coupon." There's no getting around this one! It is considered illegal to sell coupons online so why would you buy them and support unethical people trying to make money off unsuspecting shoppers? If you know someone who buys coupons online or anyone who promotes the use of coupon clipping services feel free to direct them to the CIC or the coupon inserts companies for that matter. My guess is that many of them had no idea it was illegal! On a side note: Why aren't these sites being prosecuted? I have heard of several prosecutions in the past, but am still looking into this and will let you know what I find out! Ugh, I've been sitting here trying to even figure out how to title this post and be the most pc about it that I can. But, there's just no way around the truth, no matter how bad it sounds. I have been saddened lately by the number of Walmart Ad Matchers who I have personally witnessed, or been told of, pulling prices out of thin air, claiming to price match from a competitor's store. It happened again tonight as I went in to a Walmart to help out with the new coupon policy that is being implemented for Utah County. First, let me just say that Ad Matching is a privilege, NOT a right. Walmart does not have to let shoppers price match if they don't want to. However, in an effort to be the "low price leader" they offer this promotion in their stores. Yet, I believe a large percentage of shoppers lie about the price of a product, (and sometimes almost every item in their cart), each week in an effort to save a couple bucks. These shoppers know they might not have to actually prove their ad match price by showing the actual ad so they help themselves to a few extra cents here and there. What's a penny or two to a big company like Walmart right? It won't hurt them will it? I have said it before and I'll say it again, a person's integrity ought to be worth more than a quarter! You would be amazed at how many times I have been told by shoppers that they know someone (or are someone) who makes up prices on a regular basis. What in the...? Purposefully making up prices at Walmart to ad match is stealing. It's stealing potential revenue from the store, just like shoplifting, but even worse in my opinion, because lying to a cashiers face takes more cowardice than sneaking out of a store with an unpaid tube of lipstick in your purse. I have heard of shoppers driving miles out of their way to go to a different Walmart so they can get in line with the "nice" cashiers that will let a shopper do practically whatever they want. What a sad statement that makes. If you intend to price match a sale item at Walmart remember, the price you give the cashier should be the actual price of the product, not the price after a coupon you saw listed on my website (you would actually need to have the coupon to get that price), nor a made up price, nor a price you saw last week but weren't able to get. The ad matched price should be the exact price that day as advertised in a sales flier not including catalinas, Register Rewards or Up rewards. Anything else is just plain theft! Why "cheat" the system at any store! When you cheat them you're really cheating yourself. hole post for the perfect binder carrier! And voila! The shopping card cradles my coupons from falling and I can easily flip the pages and find anything I need - especially any coupons I might have for unadvertised sale or clearance items! Benjamin Franklin said "there's nothing certain in life but taxes and death!" I'd like to add savings to that infamous quote as well. You do have to be disciplined enough to actually save your new money from adjusting your # of dependents. Just blowing the extra money on frivolous purchases is far worse that letting the government hold on to it for the year. Make sure you take that extra money and really invest it somewhere safe so that it isn't wasted by you instead of being wasted by big brother. Either way would just be a waste. The birthday freebies just keep rolling in! 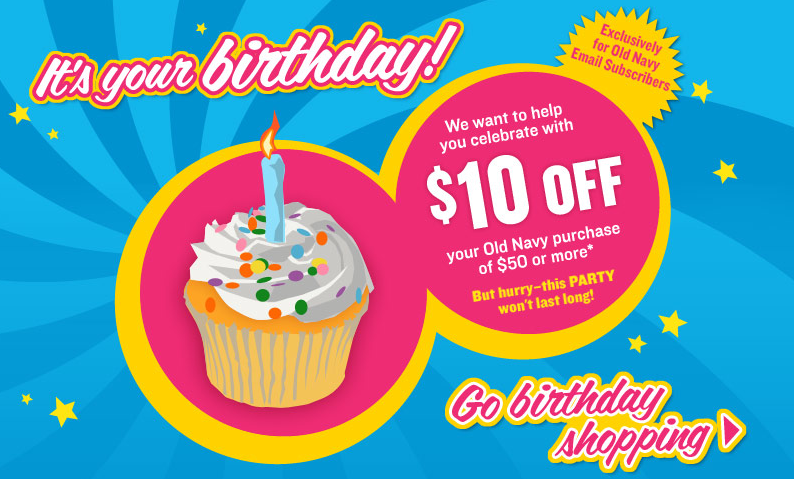 When you sign up for Old Navy emails you'll receive a $10/$50 Old Navy coupon on your birthday. 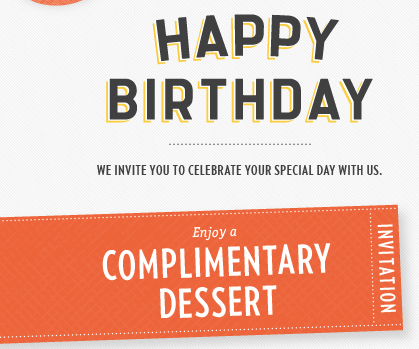 See My Favorite Birthday Freebies! While I consider myself to be a coupon master, having couponed for over 19 years, I am not, and hope to NEVER be, an extreme couponer! I may have a great food storage "stockpile" but it has never been at the expense of others nor has it taken the excessive amount of time some shoppers waste on an almost daily basis! Tonight, for the 1st time, I watched Extreme Couponing on television. Honestly, I was appalled by much of what I saw! Let's just say I will not be watching again. From buying over 60 bottles of mustard (and purposely taking all but one on the shelf) which her husband doesn't even eat, to spending over 5 hours in the store and calling friends to stand in line for you just so you can save $10 is beyond ridiculous. Or how about the woman who did 18 transactions at the store which took her over 1 hour just so she could double 3 Albertsons coupons in each transaction! They had to close the checkout line behind this woman because she took so long. I actually yelled at the t.v. when a woman bought over 30 bottles of Maalox and she didn't even get them for free. Either you and your husband have some serious stomach issues and need to see a doctor asap or you need to see a psychologist! I don't even know what to say about the woman who said her stockpile was almost as beautiful as her children - how can that even come close?! What ever happened to customer courtesy? This isn't savings for their families, it's savings IN SPITE of other families! You will rarely hear me be critical of others, but in this instance I cannot hold my tongue. I believe these women (and men) have real shopping addictions and need to seek professional help. I'm absolutely serious in that. It's interesting that this television series runs in between Hoarding and My Strange Addiction shows don't you think? This show gives couponers a bad name as overbearing, almost maniacal shoppers. 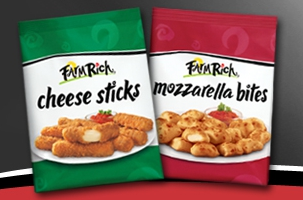 Not only that, but I believe this show could have serious ramifications for the rest of the couponing world. It's absolutely possible that stores may start limiting the number of coupons shoppers can use in transactions and coupon values can also be dramatically reduced. 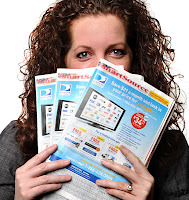 The way coupons are distributed may also come into question, like the woman who had all the extra coupons delivered to her home by her carrier - this directly violates newspaper contract policy! Or the woman who had her young children and pregnant friend dumpster diving for extra coupon inserts. What!?! I have taught shoppers how to coupon for almost 2 decades to ensure that everyone can save and have fun shopping. 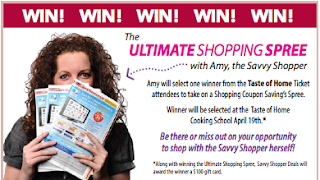 This show makes this couponer "extreme"ly frustrated as it undermines all I've tried to do! The last time this show aired I got several emails asking me to teach them how to be extreme shoppers. I will never teach someone how to be a greedy, obsessive, addicted shopper. I believe it's fundamentally wrong on so many different levels and absolutely disturbing! Will the real couponing community step up and call this show out for what it is - garbage! 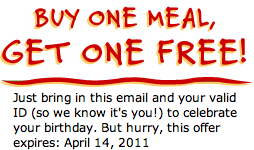 You don't even have to sign up for this birthday freebie from Jack In The Box. Just print the FREE Jack In The Box Dessert Coupon and take your ID into a Jack in the Box location on your actual birthday and voila - a FREE Dessert! Every year I am the emcee for multiple Taste of Home Cooking School shows. 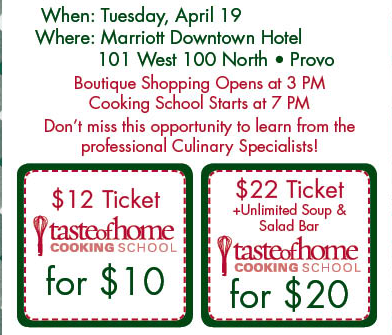 The Taste of Home Cooking School is truly one of my absolute favorite events of the year. If you have never been, every person who attends gets a goody bag filled with product samples, coupons, Taste of Home Magazines etc.... In addition, I fill a shopping cart to the brim with products and ask attendees to guess how much I paid for all the groceries with the closest "guesser" taking home all the groceries. I swear, every year someone guesses that I paid $400-$500 dollars for the groceries. If this was you - you need a grocery intervention and I am here to intervene! I decided that instead of giving away a couple tickets to the show, as I normally do, I would give away an exclusive, one on one, shopping trip* with yours truly. I'll provide the coupons and even $100 to spend (can you imagine how much we can buy with that!!!) to one lucky winner who is in attendance at the Taste Of Home Cooking School on April 19th. I'll share insider shopping tips and tricks and show the winner how to maximize grocery savings by simply shopping smarter! You must be in the audience to qualify to go shopping with me. I will randomly draw one name out of the grocery cart giveaway registration cards as the winner. (Estimated prize value... Priceless ;-) Your odds of winning are actually pretty dang good seeing as there are only 750 seats available! Tickets are only $10 for the boutique shopping, show and gift bag and only $20 for the boutique, show, gift bag and ALL YOU CAN EAT soup & salad bar. Hurry and buy your tickets before they sell out - and they ALWAYS do! *Shopping trip date, store and time to be determined by Amy. I am a busy stay-at-home mom (kinda redundant, I know) trying to balance family and gourmet food on a budget. I live with four handsome boys...five, if you include my husband! I began blogging 2 years ago after my third son was born as a way to connect to other moms out there and to have a creative outlet for my cooking. Never could I have imagined the lessons and tips I would learn in the process or that I would have another son during my journey which is where the "budget" comes into play! I have discovered my strengths, weaknesses, and a desire to serve my family healthy meals while staying on a budget. It's not always easy but definitely doable! I am so excited to be here on Savvy Life and The Savvy Shopper to share everyday recipes that may help you provide gourmet food to your family while cooking on a budget! 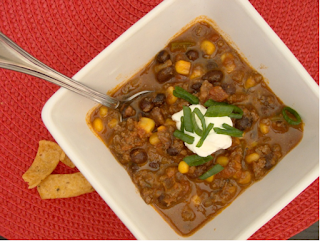 My first recipe is for Chili con Carne...a spicy, filling, and very inexpensive meal! Every couple of months, in Utah at least, there are several grocery stores who have a case lot sale. 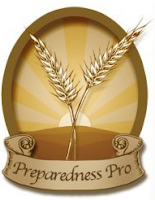 It is my favorite time to restock my pantry with canned fruit, vegetables, baking supplies, and canned beans! I feel a sense of calm knowing that my family can live on what is stored in our pantry if there were ever the loss of income, natural disaster, or one week where I simply can not get the grocery store...I know you have those weeks! My recipe for Chili con Carne uses many of the ingredients I have on hand. It is simple, flavorful, and the best part is you can make it ahead of time! In a large skillet heat the oil and add the ground meat. Brown the meat then add the onion, bell pepper, jalapeño, and garlic. Good for 2-3 minutes and add the spices. In a crock pot mix the rest of the ingredients. Pour the meat mixture into the beans, corn, and tomato and stir. Cook in the crockpot on low for 6 hours. Cooks side note: You could put this chili together in a large pot, heat, and serve it immediately if you needed to. If you do throw it together quickly make sure to cook the vegetables for about 7 minutes. Wal Mart has the best price I have found for Chipotle Chili Pepper and I LOVE this spice! I have used it in numerous recipes to have smoky heat including adding it to mayo for burgers. 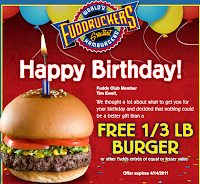 Sign up with Fuddruckers Fudds Club and you'll get a FREE 1/3lb burger for your birthday! 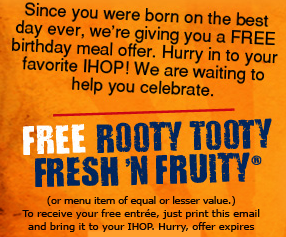 Sign up with Denny's Rewards and they'll wish you a Happy Birthday with a FREE Grand Slam! 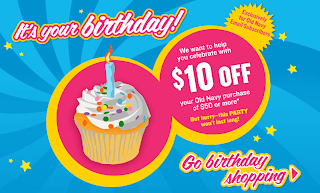 Here's an interesting birthday freebie from Payless Shoes! 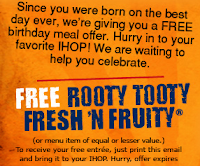 Sign up for Ihop's Pancake Revolution and get a FREE Rooty Tooty Fresh 'N Fruity for your birthday PLUS a FREE meal just for signing up and a FRE meal on your membership anniversary! My husband is the king of birthday freebies. Every year he tries to use as many birthday freebies coupons as humanly possible. I swear he is going to make himself sick someday! 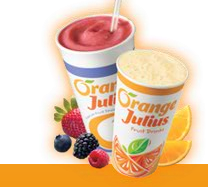 His latest birthday freebie comes from Orange Julius. He actually just signed up for this one, but the offers are already rolling in! 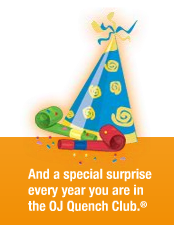 I'll let you know what the actual birthday coupon is when it arrives, though my guess is that it changes frequently. UPDATE: The coupon came and it's a BOGO Smoothie Coupon! 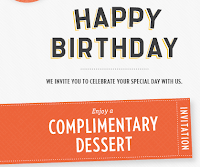 Sign up with Macaroni Grill to Get The Dish and you'll get a free dessert coupon in honor of your birthday! You also get a $5 off coupon right now! Sign up for Mimi's eClub and you'll get a FREE Meal coupon to celebrate your birthday! 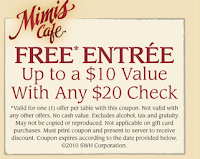 PLUS - Get A FREE Breakfast coupon right now! 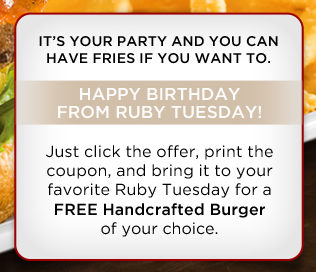 Sign up with Ruby Tuesday and you'll get a FREE Burger coupon to celebrate your birthday! My hubby and I LOOOOOOOOVE Sweet Tomatoes restaurant and have since we first tried it in California as Souplantation! 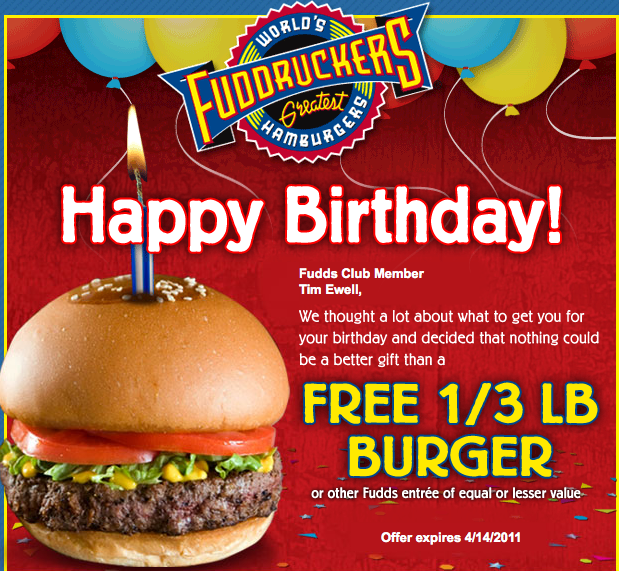 We'll it's the hubbies b-day next week and his free offers just keep rolling in! 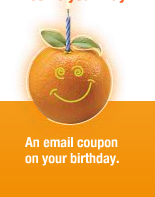 Sign up for the Sweet Tomatoes Veg Club and get a BOGO coupon on your birthday!